Wearing a grey maxi dress and red heels, former Big Brother star Imogen Thomas arrived at her baby shower in London on Wednesday October 7th. Inside it was decked with pretty pink and white flowers – some made out of chocolate. Perhaps to help Imogen with a sweet tooth craving? Also accompanying the sweet tooth was an array of marshmallows, bags of Haribo and beautifully decorated pink cupcakes. She and boyfriend Adam Horsley expect their second child — a girl — in November. They are already parents to daughter Ariana Siena, 2. 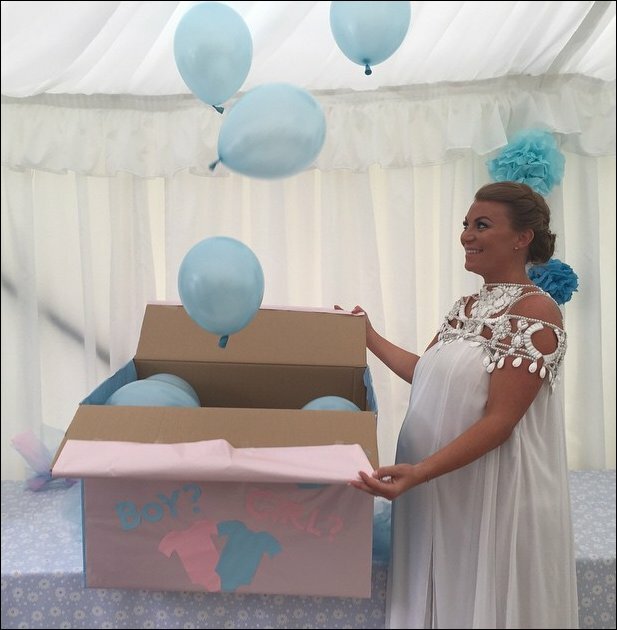 Celebrating her baby shower in a beautiful white Prodica beaded neckline maxi dress on Sunday, May 3rd 2015, reality TV star Billi Mucklow revealed that the baby she is expecting with fiancé Andy Carroll is going to be a little boy. 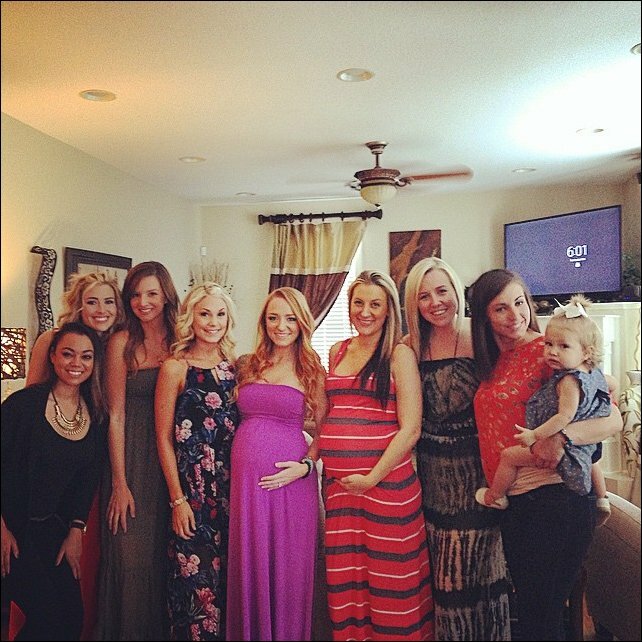 Had a wonderful shower yesterday celebrating Baby Jayde! Thanks to everyone that was a part of it. Jayde is already such a lucky little lady! The reality star also revealed that being pregnant a second time is very different from the first. Baby on the way is due in March. Nicola and husband Tom Williams are also parents to son Rocky, 4. It was a Girls Next Door reunion on Wednesday, September 9th, for Holly Madison and Bridget Marquardt, who treated friend Kendra Wilkinson to a baby shower. Kendra, 24, the star of the Girls spin-off Kendra, is in town visiting for the week from her new East Coast home. Pregnant Kourtney Kadashian has revealed that it will be her mum Kris Jenner who will be hosting her baby shower in November at the family home in L.A. However, keeping the guest list under control is proving to be a difficult task. Mum-to-be Ellen Pompeo was joined by 25 friends, including Kate Walsh, Sandra Oh and Rebecca Gayheart, for a baby shower held on Saturday, August 29th at Katherine Heigl‘s home in the Los Feliz section of Los Angeles. Ellen and her husband Chris Ivery are expecting a baby daughter in October. The catered outdoor baby bash was held in the backyard. Umbrellas shielded guests from the heat – L.A. temps reached 104 degrees Saturday – and pink flower arrangements and candles accented the tables. Guests brought gifts wrapped in girly pink and yellow colours. Many of the gifts – which included a Sleep Sheep toy mobile, Sleepy Safari stacking toys, organic hooded towels and a Kiddopotamus organic swaddle wrap – came from the Juvenile Shop in Sherman Oaks, where Ellen is registered. Earlier in the day, she and Nicole Richie – who also is pregnant – shared some special time together.